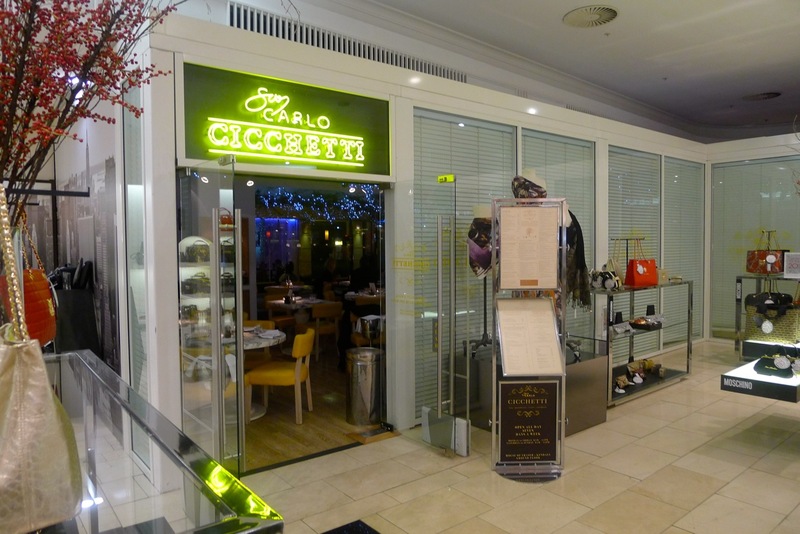 Located on the ground floor of ‘Kendals’, San Carlo Cicchetti is the ‘little sister’ to the popular San Carlo Italian restaurant which sits across the way. The impressive art deco department store’s origins can be traced back to 1796, when John Watts founded his Deansgate based drapery. In 1836, when three employees took over, Watts’ became Kendal, Milne & Faulkner. Then, in 1919, the company was bought by Harrods and traded under the famous name for a short period before protests from customers and staff forced the ownership to revert to the name Kendal Milne. In 1959, House of Fraser purchased the Harrods group; (although maybe fearing further uprisings from the staff and customers) the store continued to trade under the Kendals name until 2005. Since then, House of Fraser has been the store’s official title. The 1919, staff and customers showed true Manchester spirit, reminiscent of the time when a group of local residents in nearby Coronation Street campaigned to save the street’s famous cobbles. I don’t know how House of Fraser managed to slip the name change through - perhaps today’s staff and customers are not concerned about such things? Maybe the Rover’s Return should become a Wetherspoons or be renamed the Cap and Whippet? 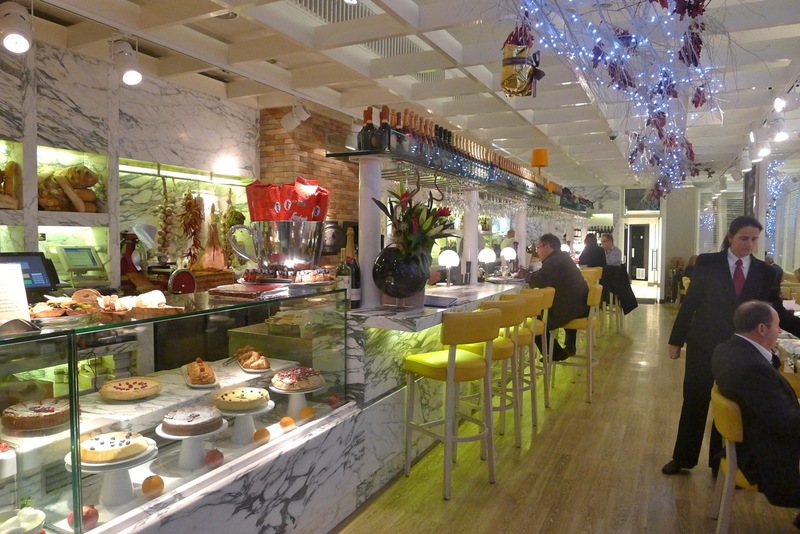 Since the opening of Harvey Nicks and Selfridges in the city I do not get down to Kendals, sorry, House of Fraser very much – that will soon change as I have just discovered Cicchetti! Above the doors (one into the store and one onto King Street) yellow neon signs vibrantly welcome diners into a restaurant / pizzeria / bakery / deli / bar which oozes Italian chic. 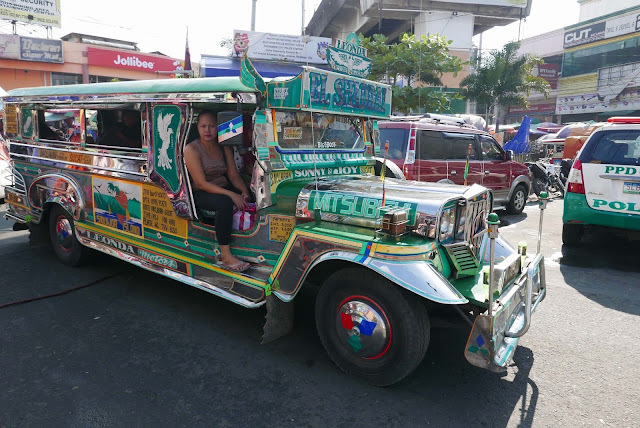 There is no stereotypical kitschy checked tablecloths, irksome accordion music, clichéd candles stuck into Chianti bottles or hackneyed pictures of Mama on the walls. 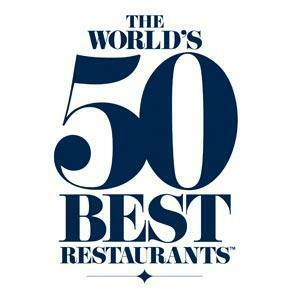 Instead, diners can expect a largely white, well-lit modern space. A pop of colour is provided from the lemon yellow, leather cushions, chairs and barstools. 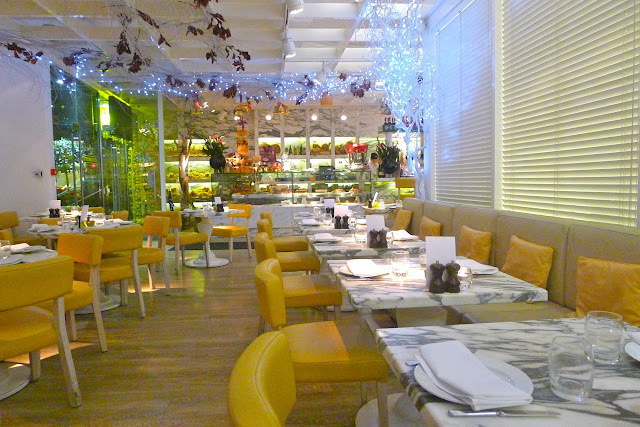 Tables are fairly close but not overly so; they are simply set and furnished with olive oil and salt and pepper mills – I do not like it when, in many Italian restaurants, the wait staff appear brandishing a oversized grinders and proceed to season your food with an overly exaggerated flourish. 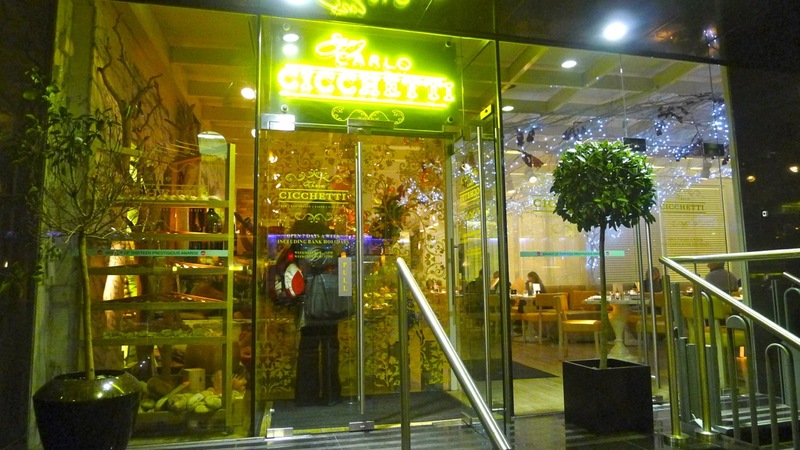 From the moment they enter, customers are served a true slice of Italian flavour. 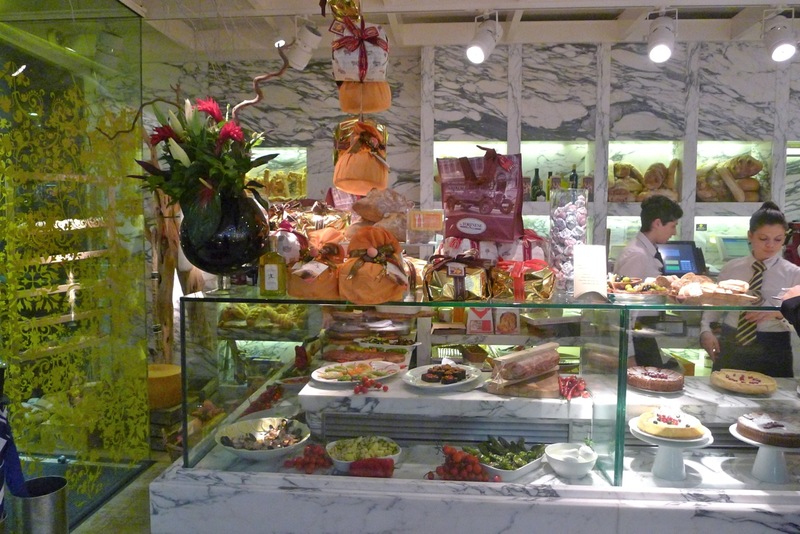 The deli and bakery area is piled high with traditional goodies - an amazing array of antipasti and a delectable display of all things delightfully dolce! 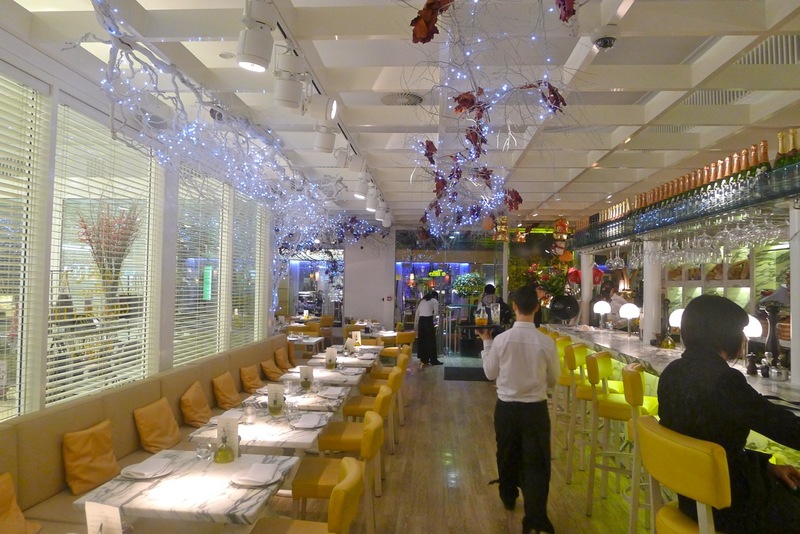 The largely (if not completely) Italian front of house team are as slick, sleek and polished as the fine Italian marble tables and bar area. 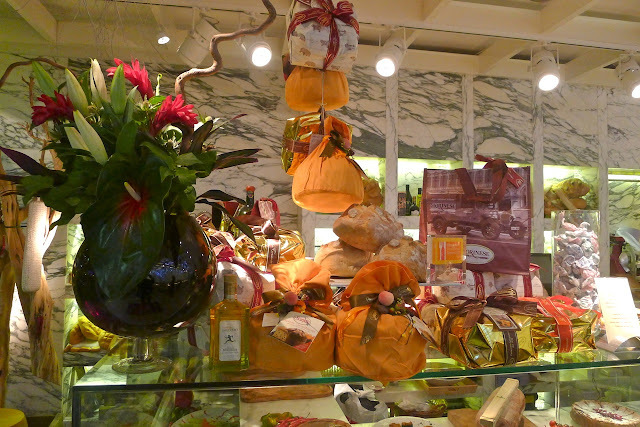 Every other word seems to be a cheery, “Grazie.” “Scusami” “Ciao!” “Bellissimo!” or “Buon appetito!” – it’s almost as if someone has said to them, “Say lots of Italian stuff… the customers lap it up!” We did. Looking outside at the dreary weather is the only clue you have that tells you that you are in Manchester and not Milan. Of course, if you look out of the other window, you can see people shopping for cosmetics and handbags; thankfully the blinds obscure sufficiently to pretend that these are not potential wives for Manchester’s footballers, but Milanese fashionistas. 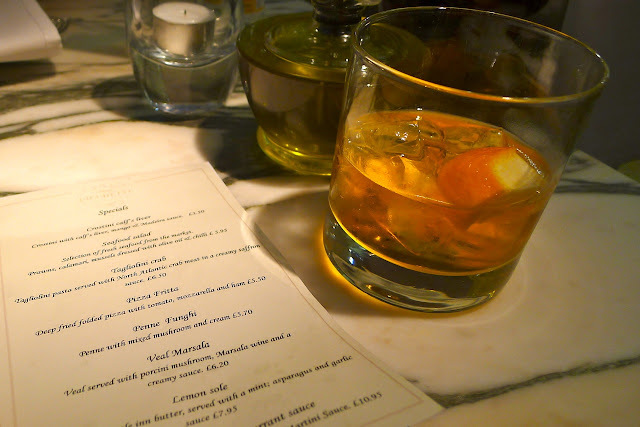 Whilst we perused the fairly large but manageable menu, we ordered aperitifs. Needing a stiffener after a morning of busy Christmas shopping my wife went for a double vodka and tonic. 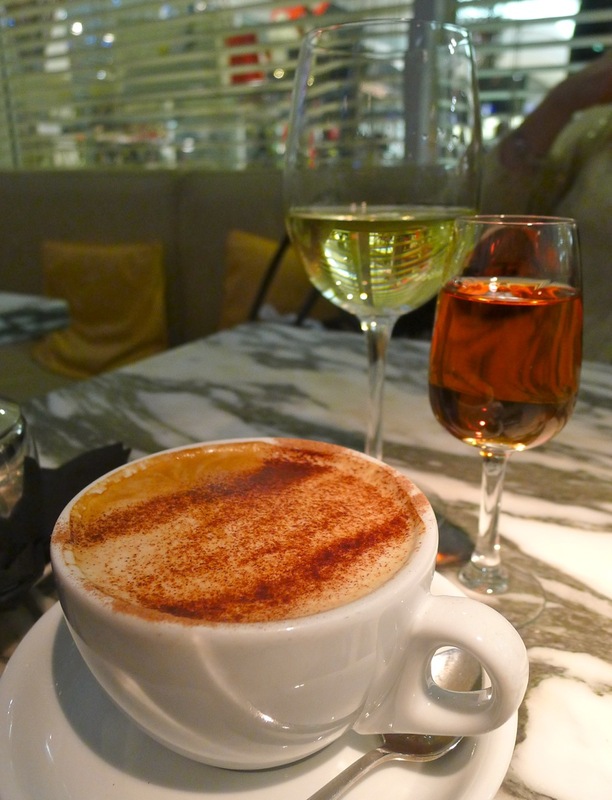 Thinking, ‘When in Rome!’ I ordered an Italian non-alcoholic aperitif called Crodino. Personally, I think it should be called Crud-ino. It was very bitter with a hint of oranges and vanilla (think fizzy medicine!) It may be an acquired taste but not one that I am in a hurry to acquire; but, hey, I’m glad I tried it. 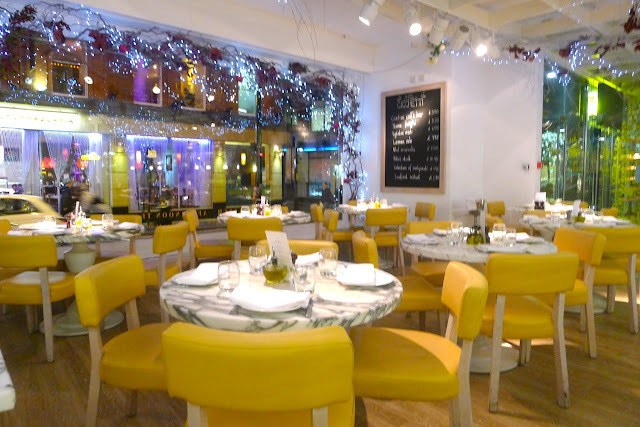 The menu, hence the restaurants name, is based on the Venetian culinary custom and concept of cicchetti – small plates and tasters, to be shared or enjoyed alone with a glass or two (think Italian tapas!) 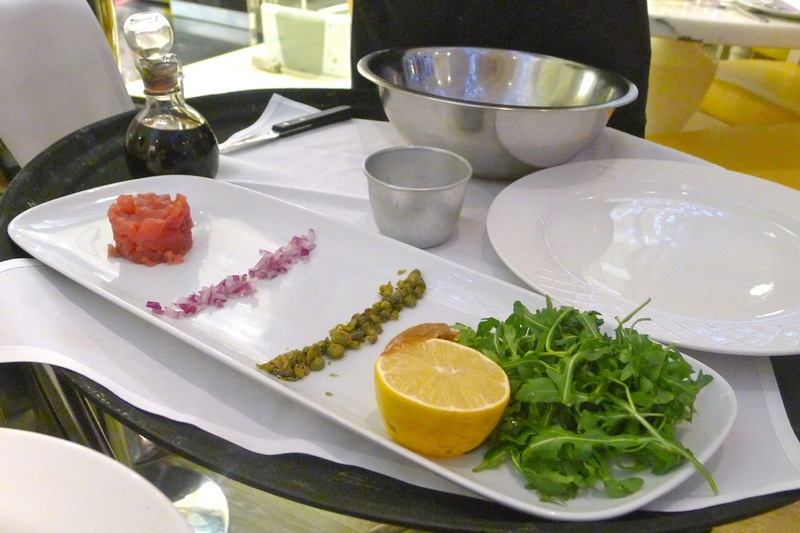 When we ordered, the waitress made a point if stating that there is no starter followed by main format and that the food comes out as and when it has been prepared by the kitchen. This was fine by us, but as it happened most of the dishes pretty much arrived together. 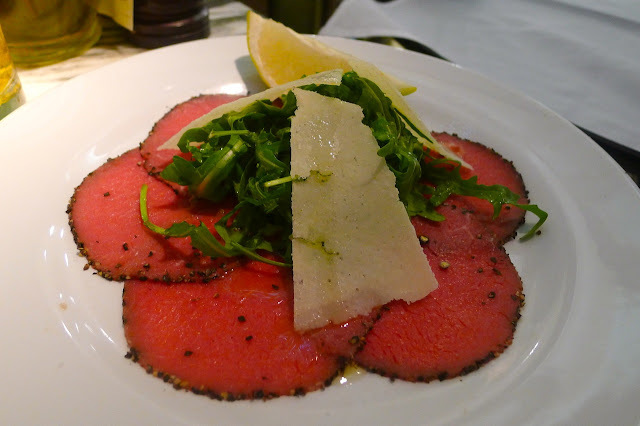 Carpaccio of Angus Beef with Parmesan & rocket – meltingly tender, with generous shavings of Parmesan. 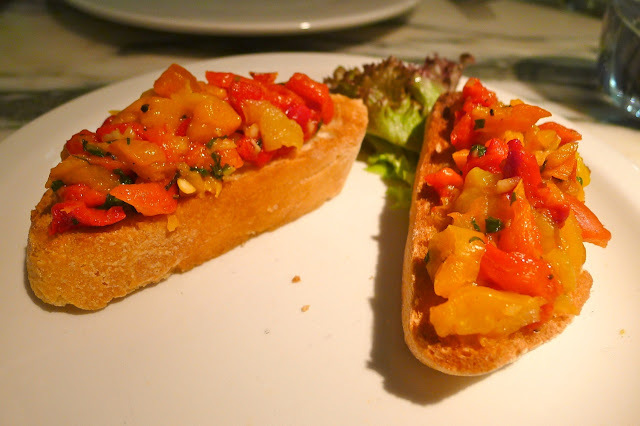 Crostini with roasted Sicilian peppers, garlic & parsley – this was not as flavoursome as expected; though it was still very enjoyable. 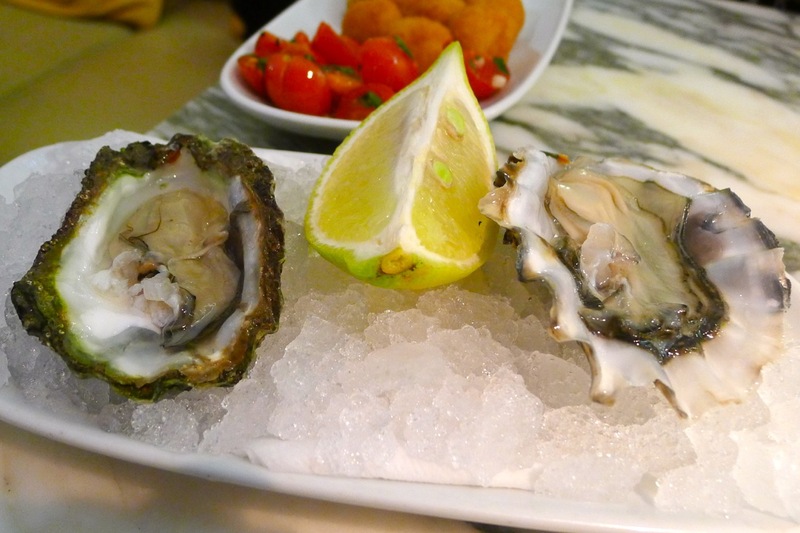 Oysters with lemon - these were served at a pleasing temperature; not too cold so that they could be chewed comfortably and enjoyed. 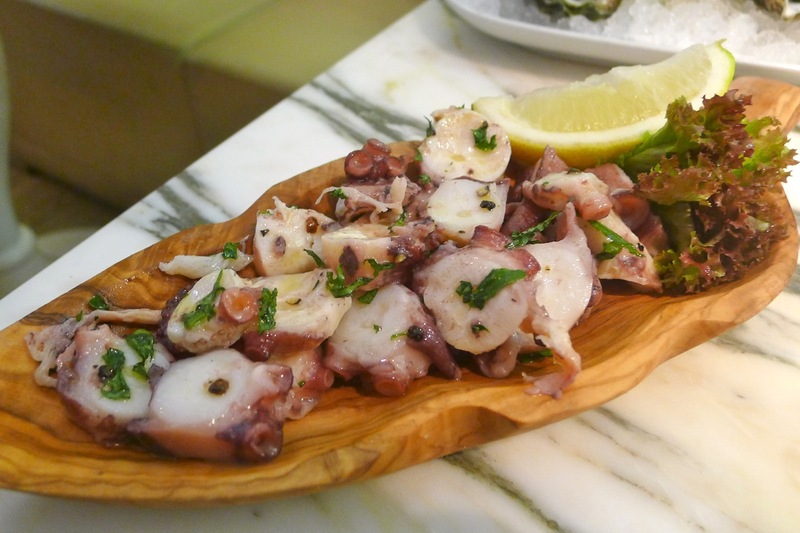 Octopus salad with olive oil, lemon & garlic – another generous portion; simply flavoured. 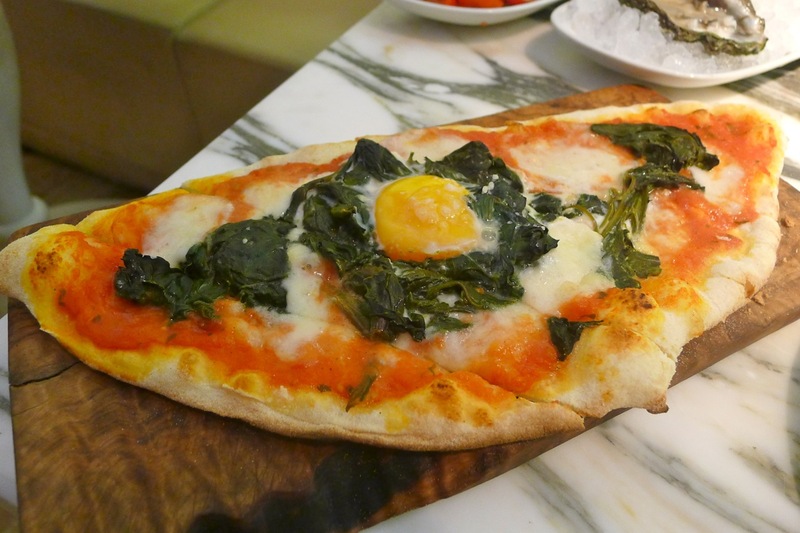 You can’t go wrong with oil, lemon and garlic! 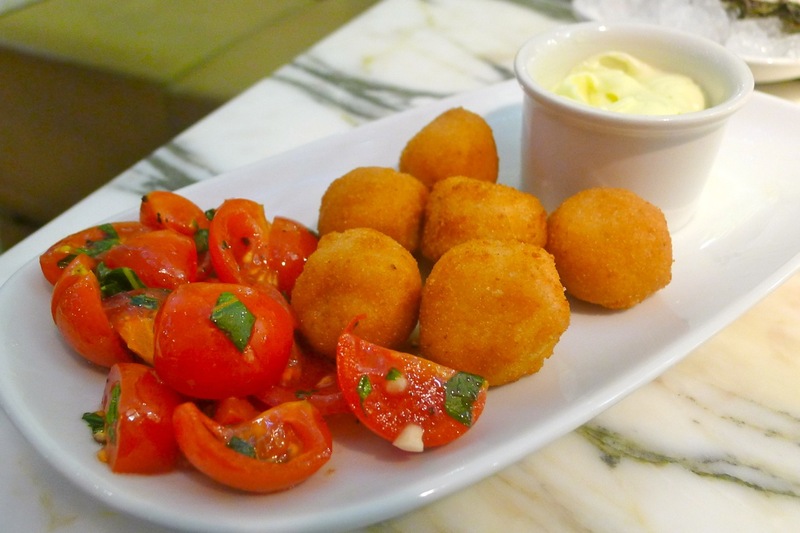 Breaded baby mozzarella – served with mayo and fresh tomatoes with a basil dressing. My only criticism being the disproportionate about of tomato... to rectify this, I wouldn’t have said no to a couple more of the delicious balls. 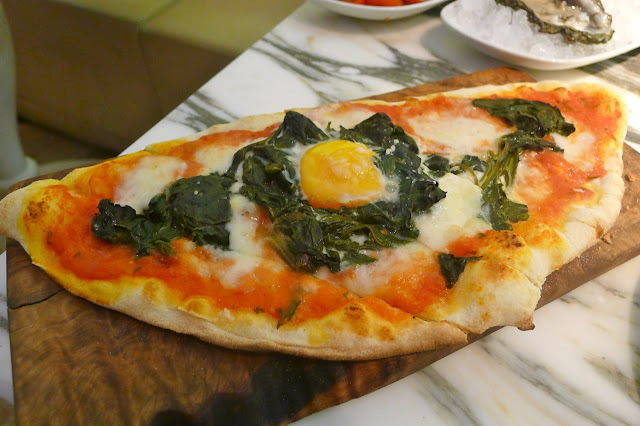 Pizza Fiorentina, with tomatoes, buffalo mozzarella, spinach & egg – lovely fresh dough with a perfectly cooked egg nestled on top. 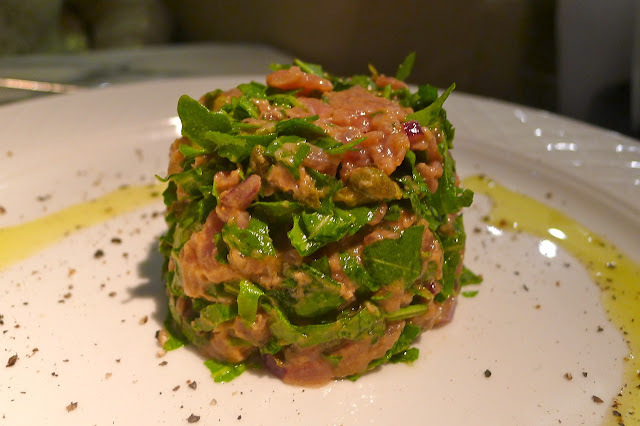 The final dish to arrive was the Tartare of fresh tuna mixed with olive oil, French mustard, lemon juice, balsamic vinegar & wild rocket, which is constructed at the table. 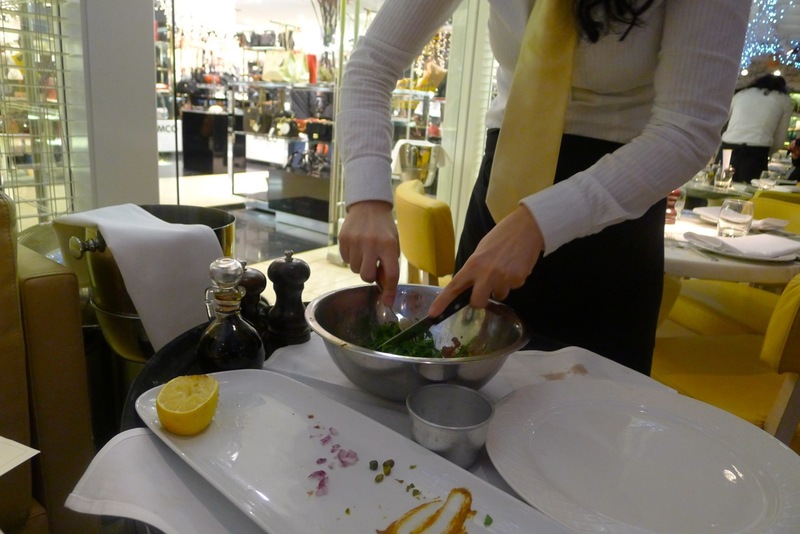 I always love the theatre and spectacle of dishes prepared at the table and this was no exception. The ingredients arrived beautifully presented to be deftly chopped, blended and served surrounded by a drizzle of olive oil and a, not too overly exaggerated, flourish of cracked black pepper. Oh, yes, it tasted as good as it looked too! For dessert, they were sadly out of the Panna Cotta served with rhubarb that had caught my eye earlier. 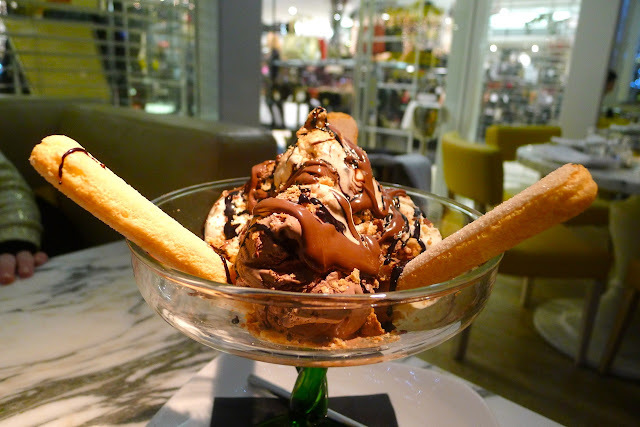 My wife and I therefore decided to share the Coppa Golosa - Chocolate, hazelnut & caramel ice cream with crushed Ferrero Rocher & warm Nutella. I like to think that I am fairly knowledgeable about food but I had always assumed Ferrero Rocher was a French invention; it turns ‘Ferrero’ is an Italian company that are behind both the ambassador’s favourite and the kid’s favourite, Nutella. Whatever their ‘provenance’ (if you can say that about chocolate spread) they combined exquisitely here – it’s just a shame I had to share! We ended the meal with Vin Santo and an excellent Cappuccino. Ti piace? San Carlo Cicchetti… Ti amo!